Tough and tolerant of a variety of growing conditions, yet presenting beautiful delicate-looking blooms in the spring, the iris is a perfect choice for the casual gardener. These little warriors can exist and even thrive with a minimum of care, given some sun, some water, and some soil or organic matter in which to root. 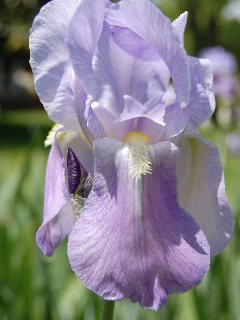 The large genus of perennials belonging to the family Iridaceae has many species and hybrids that are further sub-divided into groups, some of which are the Japanese Iris, the Siberian Iris, the Crested Iris, and probably the most widely grown and most commonly recognized of all the iris species, the Tall Bearded Iris. Bearded irises are so named because of their distinctive appearance, having a colorful fuzzy-looking “beard” that falls downward across the middle of the descending flower petals. Not only are irises easy to grow, but they also multiply quickly and are available in a wide variety of colors ranging from blue to red, purple, yellow, orange, and white. They come in a grand assortment of heights, too, from the tiny 4 inch dwarfs up to the 4 foot giants. They are useful in your landscape design when grown clustered in beds of their own or when mixed in with other types of flowers, the taller irises providing a nice backdrop to the lower growing and different textured and colored varieties in the foreground. While irises will indeed grow and flower under a variety of conditions, the ideal situation is to grow them in full sun in a deep, moist and yet well-drained soil that is loose in texture and rich in organic matter. 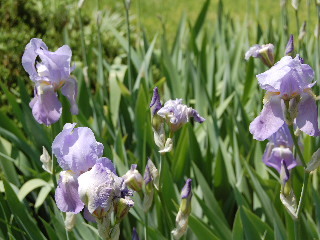 Under these conditions and with adequate irrigation or rainfall and an occasional feeding of well-rotted manure, compost, and a bit of bone meal, the irises will thrive and present you with an impressive display of large colorful blossoms that make a grand showing, standing tall in your garden. The blooms, many varieties of which are pleasantly stimulating to the olfactory senses, are also great for cutting and bringing into the house to integrate into a dramatic tabletop arrangement of mixed cut flowers. In other words, they smell good and look good, too! One of the amazing things about these unassuming little soldiers is that they are not really grown from bulbs, as many people think, but rather from rhizomes, which are actually horizontal stems that are thickened and fat with the stored food that will produce the stalks and blossoms of the iris plant. This is part of where their tough nature is apparent, as the rhizomes are not smooth, symmetrically shaped spheres or ovals like the bulbs of tulips or daffodils, but rather asymmetrical gnarled little rascals with an appearance not unlike that of small sweet potatoes. These rhizomes are planted horizontally in organically rich soil (with their tops barely covered or evenly partly exposed); if there is a question about the orientation of the rhizomes when placing them in the soil, the remains of last years roots should be visible enough to help you distinguish up from down. Now stand back and watch as tough transforms into beautiful; and, come to think of it, aren’t YOU the lucky one to be able to reap the rewards of just the minimum of labor that it took to produce these colorful elegant blossoms of iris!